Diesel power engineering specialist Royston has introduced a next generation version of its Enginei fuel management system. According to the developer, the new integrated system, with a range of enhanced fuel data analysis and reporting options, has been developed in consultation with vessel operators and owners who are putting greater importance on the availability of detailed engine and mission critical information. To meet these demands the new Enginei system uses powerful data collection software to expand the range of fuel, engine performance and voyage data used for crucial fuel analysis and optimization decisions. Lawrence Brown, managing director of Royston Limited, explained, “Access to reliable fuel consumption data is taking on even greater importance for a wide range of fleet management issues, not only for fuel efficiency but to assess emissions compliance, plan engine maintenance and assess vessel suitability for different operations. At the heart of the modular Enginei system is an expanded on board flowmeter and sensor system. This gives the upgraded system the ability to acquire comprehensive real time engine and vessel performance measurements beyond the usual RPM, GPS and fuel inputs to take in a wide range of other engine control unit outputs. This includes data from torque, weather and trim sensors and other vessel performance criteria. This increased scope means the on-board monitoring system can be configured to meet precise operator requirements to make accurate fuel analysis calculations and customized reporting formats. The information captured on board is made available for remote interrogation by onshore management and supervisory staff through a secure online portal and web dashboard, with enhanced data transmission between ship and shore. Importantly, the new data options include the measurement of fuel consumption by individual engines to enable operators to more accurately determine actual engine load for the scheduling of service and overhaul requirements. In addition, specific fuel burn data can be provided for different vessel operational modes, as well as consumption measurements per passage and by different captains. All data collected by the Enginei system can be automatically incorporated into daily reports and vessel energy efficiency plans in a range of formats. The powerful data collection features and web platform are expandable, allowing additional user requirements to be incorporated as needs change. On board the vessel, touchscreen monitors on the bridge and in the engine control room show all aspects of key vessel performance criteria using simple dial displays and gauges or more complex presentations of trending graphs against voyage data. The new upgraded Enginei fuel management system is the result of a six-figure product development program by Royston that has drawn on the company’s considerable experience in marine engineering. 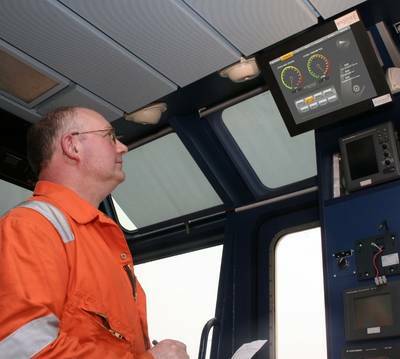 Lawrence Brown said, “We have used our specialist diesel engine technology experience to develop an advanced fuel monitoring system that meets the needs of both on board engineers and the onshore monitors responsible for much broader fleet management decisions. New investment in the improved hardware and software associated with the new system has been accompanied by an expanded Enginei team within Royston to provide the necessary installation, data analysis and technical support required by an expanding customer base across all marine sectors. The upgraded Enginei integrated fuel management system is compatible with all marine engine types and can be interfaced with newbuild engine installations or retrofitted to operating vessels.